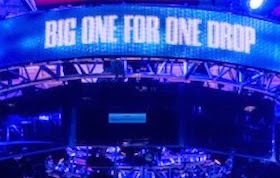 So the second installment of the $1,000,000 buy-in Big One for One Drop kicked off on Sunday, with 42 taking part. That’s a smaller field than the first time the event was staged two years ago when they drew 48, thus meaning the $37,333,338 prize pool and the $15,306,668 first prize are both less than what we saw in 2012. Seems strange to look at figures like those and regard them as thought they are somehow disappointing because they aren’t bigger, but such is the way of comparisons. And hype, too, as it certainly sounded like expectations were they’d be nearing or perhaps even hitting the 56-player cap for the event. Besides being a smaller field, there are also a higher percentage of pros taking part this time around, as several of the amateur businessmen who played in 2012 likely viewed the event as a kind of one-shot deal and thus aren’t coming back for more. The relative toughness of the field increasing thus certainly prevented a few from playing. Just glancing over the names of those involved, there only appear to be five or six who are not full-time pros with most of the others being part of the same group we’ve seen routinely taking part in the “high roller” and “super high roller” events over the last three-plus years. Thomas Keeling (SrslySirius) interviewed Phil Hellmuth for BLUFF who sounded as though he was going to play, but was too slow to get his backing in order by the time late registration ended. Meanwhile Frank Op de Woerd spoke with Haralabos Voulgaris -- another of those who played the One Drop in 2012 but decided not to this time around -- and he provided some insight regarding why others might have chosen not to play this time. As he’s bought significant pieces of several players, Voulgaris obviously has an interest in seeing who makes the final eight to cash and who wins the event. But he was noting on Twitter yesterday how in truth “nobody cares who wins,” which I think on one level is probably true, even if the poker world will get increasingly curious about how it concludes once they get to a final table tomorrow. That is to say, while the charity element is of course significant, the spectacle is all. And as with most sequels, there’s necessarily going to be a decrease in the impact earlier enjoyed by the novelty of such an event. I’ll still be following along though.